Salads are unfairly judged, with inaccurate descriptors like “boring” and “bland” and “not tasty.” These criticisms are unwarranted (Salads are fun and refreshing! They can be creamy, acidic, cheesy, fruity -- whatever you want them to be! ), but especially so if you peruse the salad section of any Thai restaurant. When you picture a salad, I’m sure you’re imagining a bed of greens, some dressing, maybe some crunchy bits like croutons and sunflower seeds. Thai salads are nothing like that -- and that’s part of the reason why they might be the best thing on the menu. These salads are so vastly different from what people generally imagine a salad to be, that it feels like a special secret among those of us who know the genius of these spicy and often meaty dishes. Firstly, I need to disclose that when I say Thai salad, I am not discussing interpretations of Thai food, with sugary peanut dressing and fried wontons, translated into salad form. I’m talking about the salads in Thailand that are primarily composed of meat (yes, meat salad!) and have robust flavors of lime, chile, sugar, and fish sauce -- the holy quadrality of Thai food. There are three categories of Thai salads: yums, tums, and larbs. Thai salads that are called yums are aptly named due to how delicious they are. Yum roughly translates to mixed or tossed together, which is what happens with these savory salads. These salads are so vastly different from what people generally imagine a salad to be. In southern Thailand, where beautiful coastal towns and fresh seafood are plenty, one of the best salads to get is yum talay or yum plameuk -- a “salad” of seafood or squid that’s dressed in acidic lime, chile, sugar, and fish sauce and served on a bed of lettuce with chopped shallots and makrut lime leaves for good measure. It’s not really a salad in the generic sense of the term -- more so a medley of seafood that’s spicy, bright, and full of chunks of shrimp, mussels, and baby octopus. Yum woon sen, or glass noodle salad, is also commonly found under the salad section in Thai restaurants. The irony is all in the name -- it’s not really a salad so much as a noodle dish -- but contains the same flavor profile as the yum talay. Health-conscious Thais see yum woon sen as an opportunity to still consume noodles without the heaviness of the egg and rice varieties, because woon sen is made from mung bean starch instead. How much healthier it is, I don’t know -- but it’s a nice thought. You can find all kinds of yums in Thailand, cultivated from different bases. There’s also yum neau, or spicy beef salad; yum som oh, a spicy-salty pomelo salad where chile and salt mingles with fruit; yum mamuang, a raw mango salad; and yum pla duk foo, which is a deep-fried catfish “salad” paired with a chile and mango fish sauce dip. Tums might actually be the most well known Thai salads. The word tum translates to “pounded,” which is exactly what happens to the veggies and proteins that make up these salads during their creation, using a traditional Thai mortar and pestle. 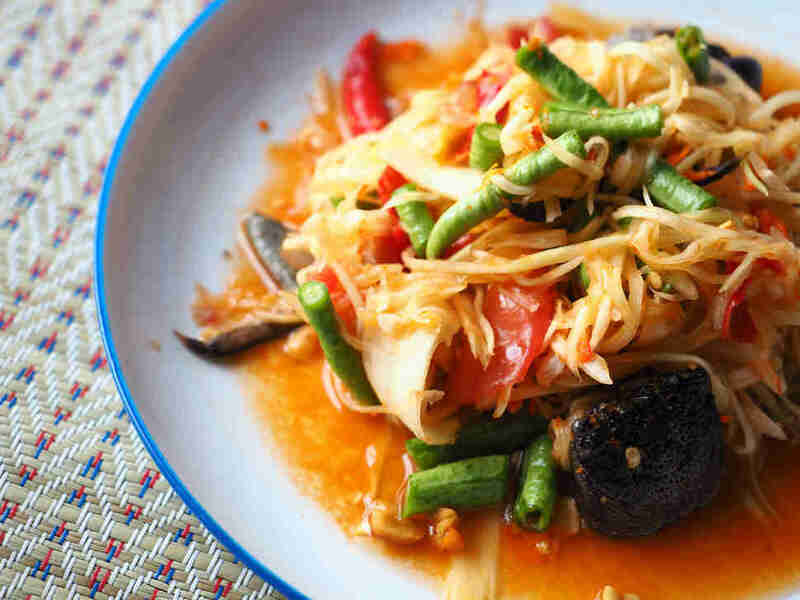 An absolute must-try tum dish is the original som tum Thai, which contains a base of unripe papaya slivers that are pounded with dried shrimp, chiles, fish sauce, peanuts, and sugar. It’s a staple food in Northeastern Thailand, where sticky rice is the main carb used to sop up the leftover juices of papaya salad, and pairs beautifully with grilled chicken, meat skewers, and fatty pork neck. It’s also a favorite among fans of Thai food because of how balanced the dish is: it’s crisp, salty, spicy, and nutty, yet also sweet. Beyond tum Thai, there are plenty of derivatives of papaya salad: tum phoo (with crab), tum kai kaem (with salted eggs), and a personal favorite, tum pala (with deliciously stinky, fermented fish). If papaya isn’t your thing, there is also tum thang, which uses the same method as traditional som tum but swaps out the base of green papaya for cucumber, and tum som oh, which is pounded -- not tossed -- pomelo salad. 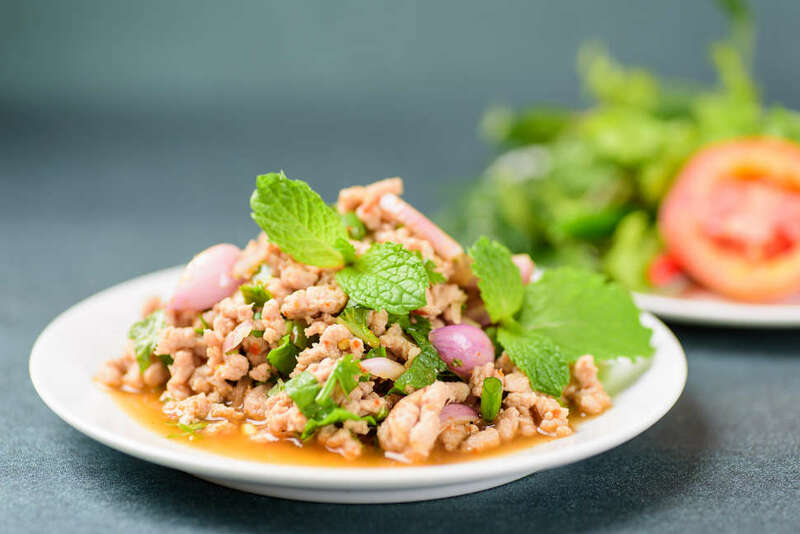 Lastly, there’s larb -- pronounced lahb with a short a sound and not ‘larb’ like Aunt May said in Spiderman: Homecoming -- which is a salad consisting of minced meats, fresh herbs, lime, chile, and dry roasted rice. It’s typically made with chicken and pork and is also consumed alongside sticky rice. Larb is special because it’s so herbaceous: expect to find fresh mint leaves, cilantro, and ground dry chiles all in the mix. Versions that feature sliced meat, as opposed to minced, are called nam tok. Unlike larb, nam toks usually uses beef that has plenty of marbling on it; the fat makes the salad extra juicy, but not overwhelmingly so against the tartness of lime. If you’ve yet to browse the salad section of any Thai menu, now is an opportunity to explore fresh, fragrant dishes that will change the way you perceive what a salad can be. Noodles and rice dishes are great, but Thai salads are the best kept secret of Thai food. Kat Thompson is a staff food writer at Thrillist and lover of Thai salads. Her favorite is neau nam tok, which is basically just steak tossed with herbs, chiles, fish sauce, and garlic -- and it’s great. For more opinions on Thai food, follow her on Twitter @katthompsonn.